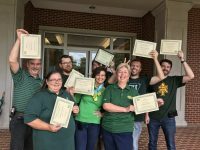 Eight staff members of the Office of Information Systems (OIS) received a Career Service Award from Dr. Bowen during her Beginning of the School Year Staff Update session. Pictured from left to right are Chris Moss (20 years), Kim Newman (20 years), Andy Stadler (10 years), Theresa Motley (35 years), Lawrence Ford (5 years), Carol Adkison (30 years), David Waterson (5 years), and Jason Salmans (10 years). OIS Director Ken Wester adds his appreciation as well, “It makes me proud to know how many people we have in OIS that have chosen to stay with the University, providing us with your personalities, time, support and skills. Your time adds to our abilities and level of knowledge that makes OIS the success it is. Thank You!”. The Ross Pendergraft Library (RPL) Technology Center offers 3D printing? For details, go to the OIS Service Catalog at https://ois.atu.edu/ois-service-catalog/, and look for 3D Printing Request. Instructional Technology Services (ITS), located in RPL 328, has A/V items available for checkout to faculty, staff, or a faculty/staff sponsored student organization. Items include camcorders, a Mevo live-stream camera, a projector and screen, and portable PA systems. The RPL Technology Center has a Vive Pro VR Demonstration Station setup for faculty and students to come and get an introduction to virtual reality and explore the possibilities of using VR for educational purposes. OIS Enterprise Services has recently completed the upgrade to Papercut, our new print management system for lab and open use printers. The new print system unifies all lab printers under a single queue (the “UniversalPrintQueue”), allowing you to print to one printer queue and release your job on any managed printer using the associated release station or the mobile release QR codes and your smartphone. Additionally, Papercut allows you to send a print job from any device connected to the Arkansas Tech University (ATU) network. You can print from your Mac or Windows laptop, iOS, or Android device and release it just like you had printed from a lab computer. Additionally, you can view your print history and submit a job by visiting print.atu.edu in a web browser. For more information visit ois.atu.edu/print. The OIS-Information Security Office is requesting that all supervisors review the secured access associated with job positions that report to them. The Arkansas State Auditor now requires proof that supervisors are reviewing access each fiscal year. We have included a “Certify Position Access” button on the Security Review form to record that you have reviewed the security for auditing purposes. Instructions for completing the review may be accessed on the OneTech Supervisor page under the “My Positions” heading. Please open the document Supervisor Position Review Security Guide. Any questions or requests for assistance may be sent via email to security@atu.edu. Mike Cain, a member of the Networked Systems team, was commissioned in the US Army Arkansas National Guard as a second lieutenant on September 8, 2018. Mike is the First Cyber Officer in the Arkansas Army National Guard. OIS Network Services has deployed Unified Communications, which includes VoIP phones, Jabber, and voicemail services, to the Computer Science, Engineering, and Math departments in the Corley building as well as to the library staff in RPL. For a quick start guide or other helpful information, search “VoIP” at https://support.atu.edu/support/solutions/folders/7000071583. OIS now maintains all campus telecommunication systems. For all types of telecommunication services (desktop handsets to cell phones), please see the Service Catalog on our Support Portal at https://support.atu.edu/support/catalog/items. 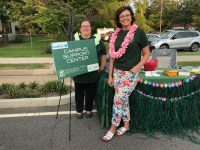 OIS staff members, Kimberly Newman (left) and Theresa Motley, enjoyed meeting many students face to face at the OIS table at the Fall 2018 Involvement Fair. They took the opportunity to remind students of how to contact the Campus Support Center (CSC) when in need of technical assistance. Students were also encouraged to download the ATUNow App and to watch for phishing attempts and never give out personal information or credentials. If you have not downloaded the free ATUNow App, you can go to either Google Play Store (Android devices) or App Store (Apple devices) to download it. OIS wishes the best of luck to all students! Enterprise Services is working hard to improve the user experience for all virtual desktops. The server hardware that supported the virtual desktop infrastructure (VDI) was upgraded over the summer. This upgrade includes new servers with SSD-based storage and graphics cards that will considerably improve the performance of all VDI virtual machines. The graphics enhancements make the user experience nearly indistinguishable from using a physical computer and will provide greater capabilities for graphic-intensive applications. Enterprise Services is also working with Desktop Services to complete the transition from Windows 7 to Windows 10 on our lab computers with this upgrade. As part of our continuing efforts to monitor and improve upon the University wireless, an update to the latest software version was applied on the morning of September 1st, 2018. To prepare for this update, a number of older access points across campus were replaced to ensure compatibility with new features. Network Services is continuing to monitor any reports of wireless issues and will continue to work towards improving the system wherever possible. If you are experiencing any connectivity issues, please contact CSC and submit a ticket. Student Workers Brook Payne (left) and Kaylen Martin are leading a team of CSC student workers in cleaning and inspecting all common keyboards and other equipment in the library. This endeavor, only executed during spare hours, will take time to complete as there are over 350 workstations including classrooms in the building. These workstations are the most heavily used throughout the semester and this thorough cleaning is much needed. We thank them for their great effort! 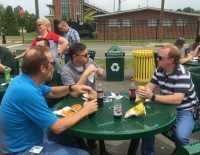 All OIS teams took a break from their summer workload to enjoy an Employee Appreciation Luncheon provided by the Director and the Associate Directors. A big shout out for the ATU Agri Club for firing up their grill to cook the hamburgers and hot dogs purchased from Chartwells. Some of the guys had a great time competing in rounds of Ladder Golf. Winners of the prize drawing included Sean Carnahan, Kevin Kilpatrick, Alex Manly, and Joe Keating. Welcomed visitors included Dr. Bowen, Dr. Bridgmon, and other friends. We all unanimously voted for a repeat next summer! 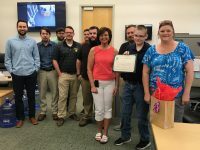 Wen Cochran (2nd from the right), son of Dr. Loretta Cochran, was an OIS/Support Services intern for the JobPath program through Friendship Services during the summer of 2018. Wen was presented with a service certificate for his excellent participation in CSC. We appreciate Wen’s service and wish him the best of luck in all his future endeavors. Amber Jacimore joined OIS as a Security Analyst on July 2, 2018. Amber graduated from an out of state college in 2016 and has worked in the information technology field in Conway, Arkansas for the last two years before joining us at ATU. She has lived here in the Pope County area for the majority of her life. She spends a lot of time outside of work volunteering alongside her husband on a K9 Search and Rescue team, enjoying any outdoor activities, and being active in her local church. Aaron Johnston joined OIS as a Computer Support Specialist in July 2018. Aaron graduated from ATU with a Bachelor of Science Degree in Math. He lives in Russellville with his wife Kristen and their dog Sybil. 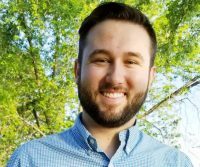 Bryan Luther joined OIS as a Programmer/Analyst on June 18, 2018. Bryan was born and raised here in Russellville until he graduated from Russellville High School in 2013. After high school, he chose to attend the University of Central Arkansas (UCA) with the original intent to get a degree in Music Education; however, he ended up changing his major and graduating with a Bachelor of Science Degree in Computer Science in 2017. In his free time, he enjoys playing music, playing video games, and studying Mandarin. Keesha Kneeland, former Campus Support Representative, has exited the ranks of OIS to pursue a new career. We wish Keesha the best of luck and continued success in her career opportunities. 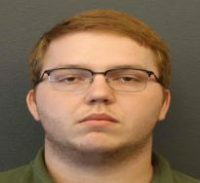 Hayden Poff, former Enterprise Service Technician, exited our Enterprise team to join the IT department as a Security Engineer at UCA where his wife is completing her degree. Upon his reluctant departure, Hayden commended all OIS teams for their ability to work together to get the job done.